Coachella, California can be one of the hotter areas of Southern California. Coachella’s climate is a subtropical desert which is dominated by an anticyclon. Sounds like a lot of mumbo jumbo, but it means that it does not rain in Coachella that much. You would think flood and water damage wouldn’t exist in these types of conditions. But this is where one would be wrong. Flooding and water damage can happen in the middle of the desert if a water pipe bursts, a tanker spills, or a reservoir fails. There are a multitude of reasons a flood can happen in a place like Coachella. Luckily, there are professionals available to save the day. The experts at Superior Cleaning and Restoration Inc. are here 24/7, accept multiple major insurance companies, and will work with you during every stage of your water damage cleanup. How much does flood and water damage restoration cost? It is too difficult to know without analyzing your property. Our experience gives us the ability to know what we are walking into, but without actually seeing the damage, we can not give you an honest quote. Call us today to have a professional cleaning and restoration expert from Superior Cleaning and Restoration Inc. get to the root of your water damage problem. Do floods happen often in Coachella, California? Floods are not necessarily common in Coachella. However, there is always a chance that floods may come from unnatural sources. 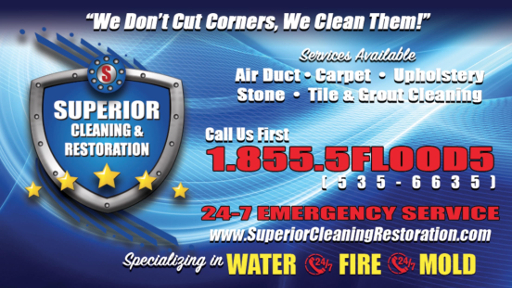 The experts at Superior Cleaning and Restoration Inc. have dealt with every water damage emergency out there. We have the experience to handle your water damage cleanup. Coachella is more than just a music festival during the summer. Our businesses and residents require the same professional service as any other city. When it comes to water damage, hire the superior choice, Superior Cleaning and Restoration Inc. Our cleaning and restoration experts will help you through the entirety of the water damage restoration. We accept many major insurance companies, are available 24/7, and will leave your property in a superior state. This superior service is what we pride ourselves on. Call us today for a free quote.